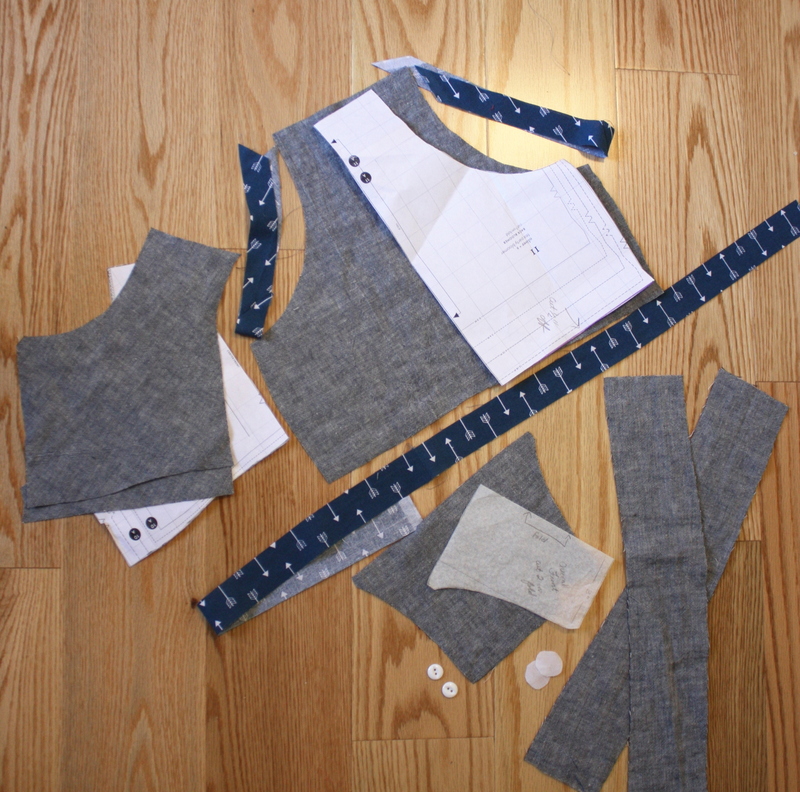 Please welcome back Rita who in the past has stopped by to share her favorite Oliver + S pattern, the Sketchbook Shirt, her Baby Tie tutorial and her Monster Hat tutorial. She has a super darling sewing project that can be made with the Seashore Bloomers; keep in mind that the bloomers pattern is also included in the Seashore Sundress and Tea Party Sundress. Thanks Rita for this wonderful tutorial! I love summer sewing. As I plan for the hotter months ahead I’ve found myself reaching for Seashore Bloomers over and over again for my little girl. I love this pattern; sometimes the simplest patterns are the best. I’ve been enjoying these bloomers so much that I wanted to make them into a complete outfit for my little one to enjoy during the hot months. 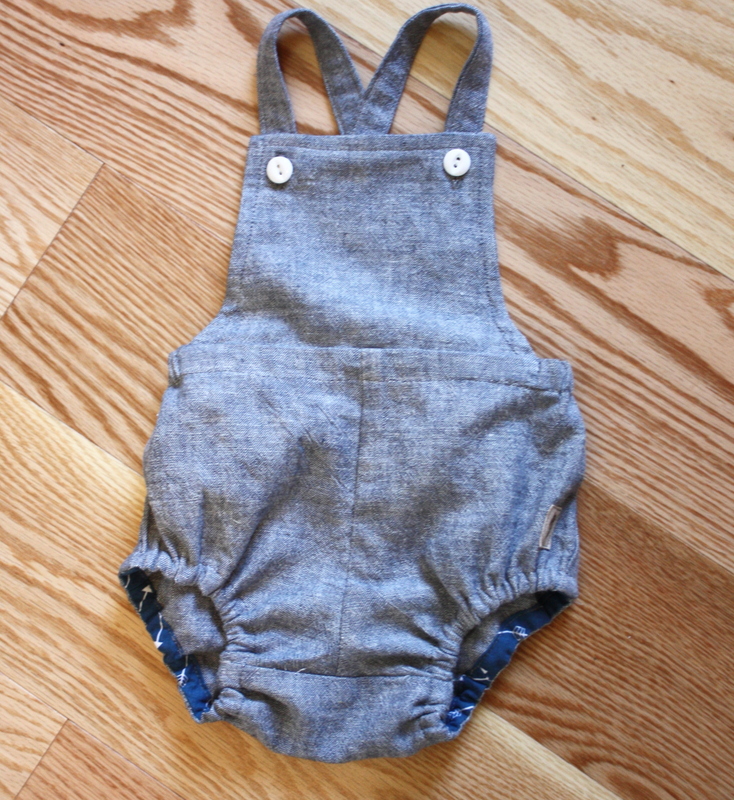 There is nothing cuter than a baby in overalls, so I added a bib and straps making them into bloomeralls! These little bloomeralls are pretty simple. 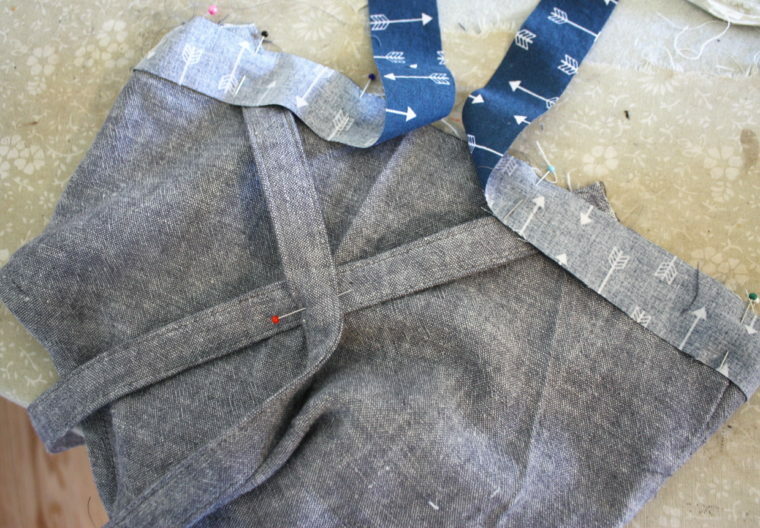 If you want to make a pair for yourself I’ll show you the steps. 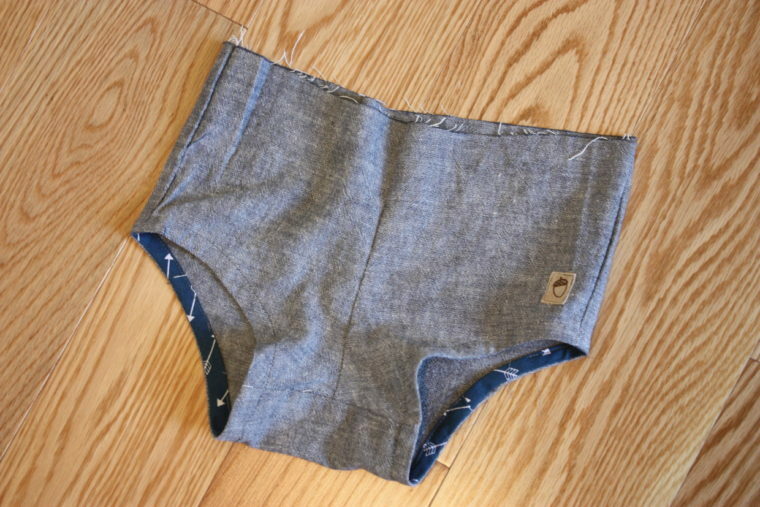 I used the Seashore Bloomers pattern (size 18-24 months) as a starting point for my bloomeralls. First, cut ½ inch off the top of both the front and the back pattern pieces since we will be using a waistband facing instead of folding it over. Next, cut out the front and back pieces from your fabric using the modified pattern. To make the bib pattern piece, cut out a rectangle 5 ½ inches by 4 inches out of tracing paper. 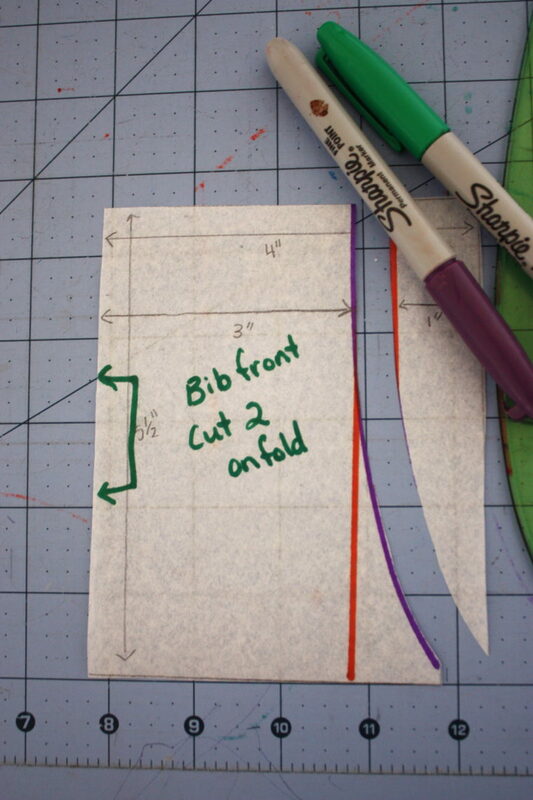 Draw a line an inch in from one of the 5 ½ inch sides and then use a French curve to create a smooth curve between the top of the rectangle and the bottom, this gives the bib a little shape. Use the bib pattern to cut out two bib pieces on the fold. Now you have all the pieces needed. 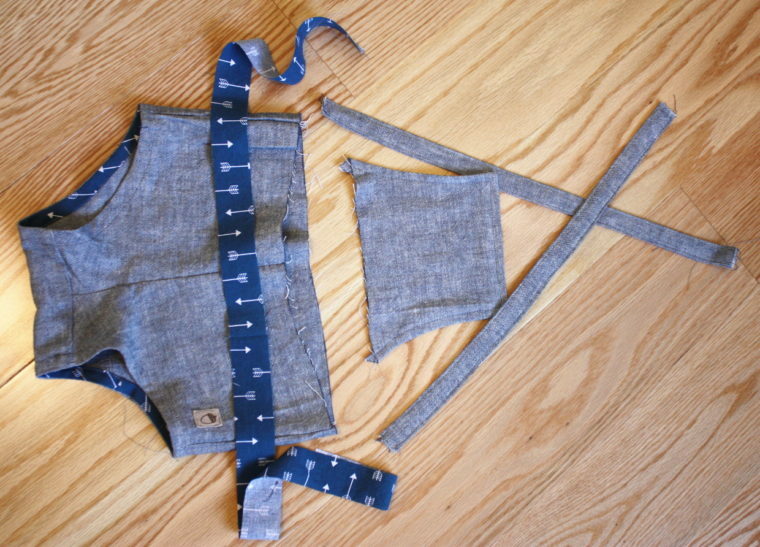 Sew the two bib pieces, right sides together, with a ½ inch seam allowance across the sides and the top. 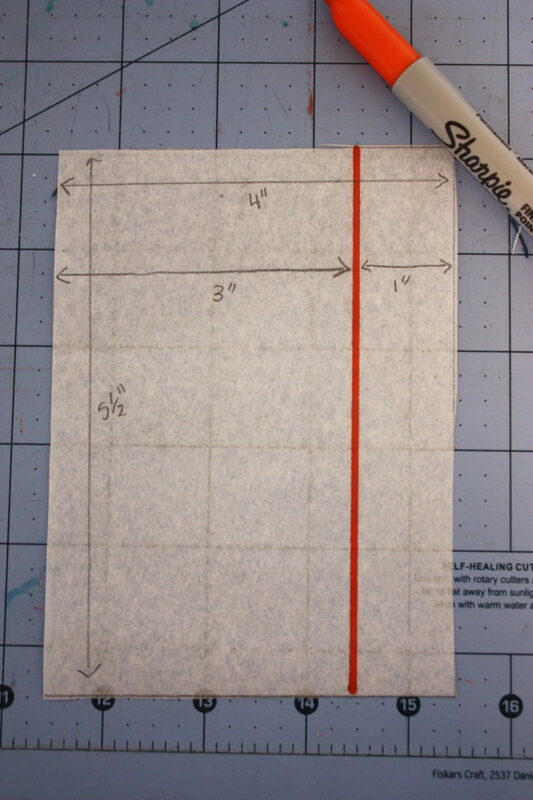 Adhere two small circles (about the size of a half-dollar) of fusible interfacing at the corners on one side, this is where you will be making the button holes later. Trim the seam allowances, notching the curves and trimming off the corners. 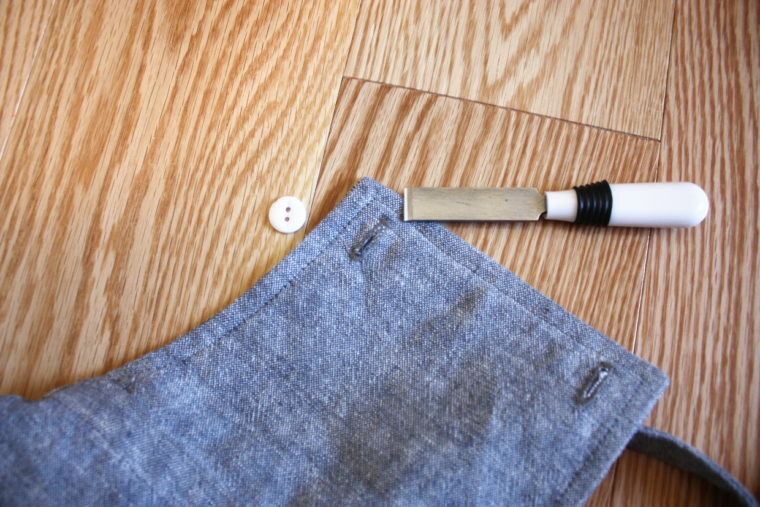 Turn the bib right side out, carefully pushing out the corners with a point turner or a chopstick. Edgestitch the bib about ¼ inch from the edge. 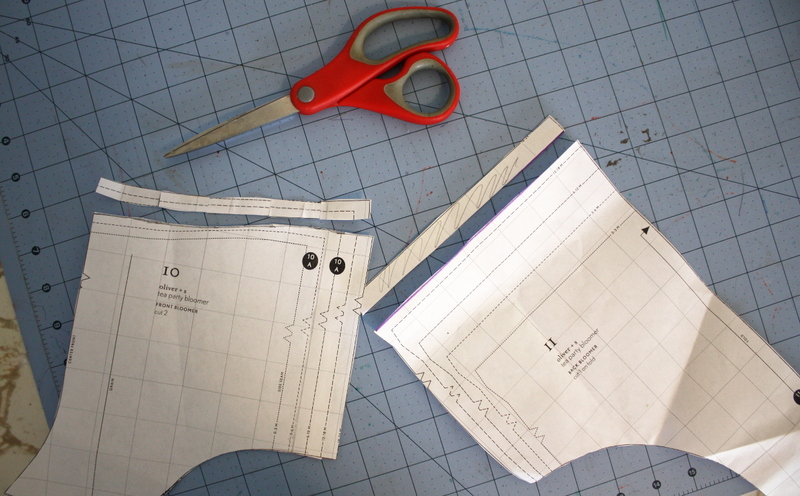 Sew the bloomer bottoms together as directed in the Seashore Bloomer instructions. 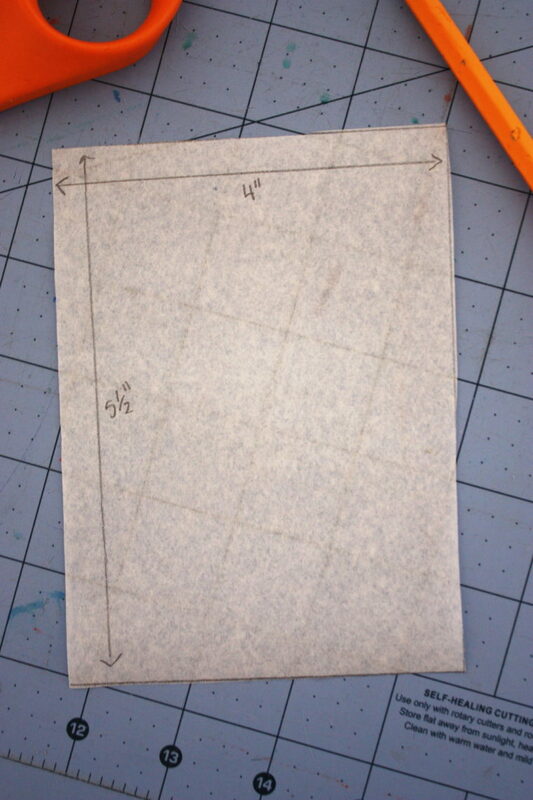 Create the casing for the elastic around the leg holes according to the pattern instructions. 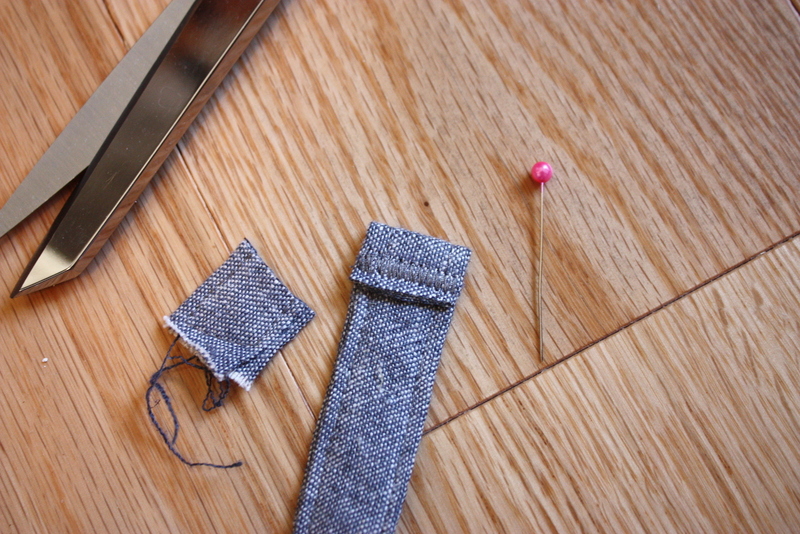 Leave the elastic out of the casing for now to make handling it easier, the elastic will be sewn in later. Take the two shoulder straps (3 inches by 16 inches) and fold the long edges to the center and press. 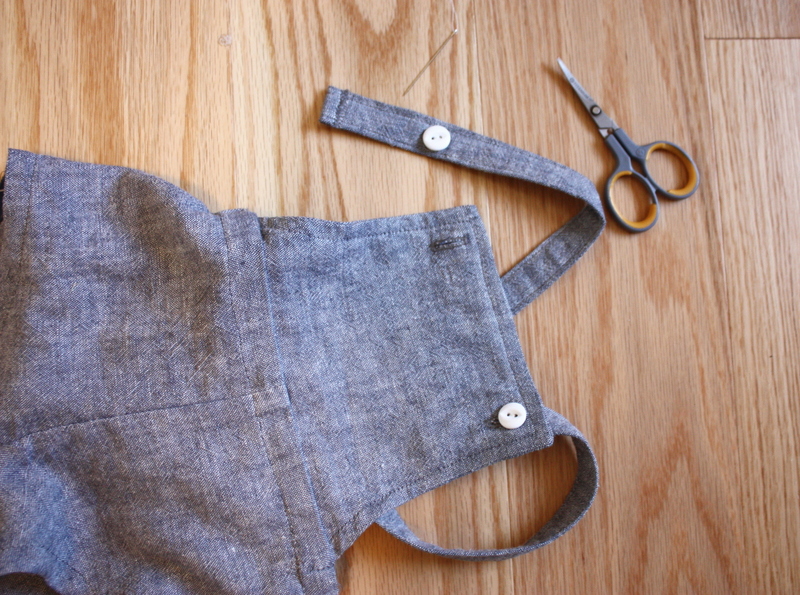 Fold the shoulder straps in half enclosing the raw edges. Now all the pieces are ready to put together. Align the center front of the bib with the center front of the bottoms putting the right sides together and baste in place. 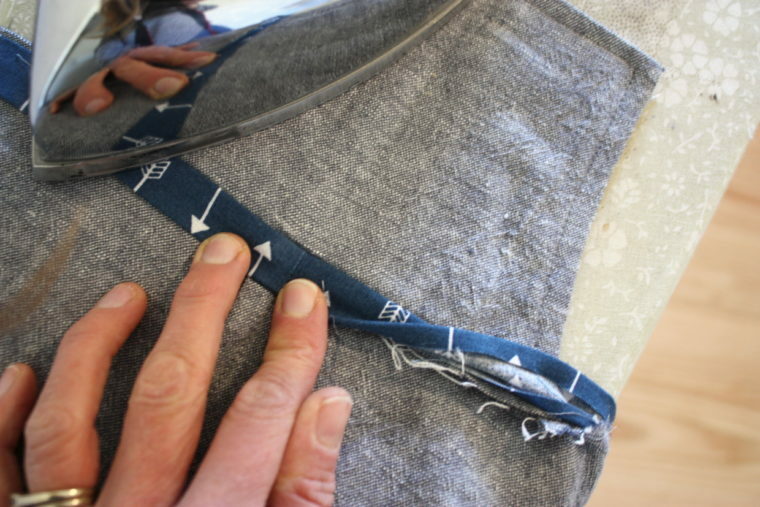 Locate the center back of the bottoms and find the halfway point between the center back and the side seams. 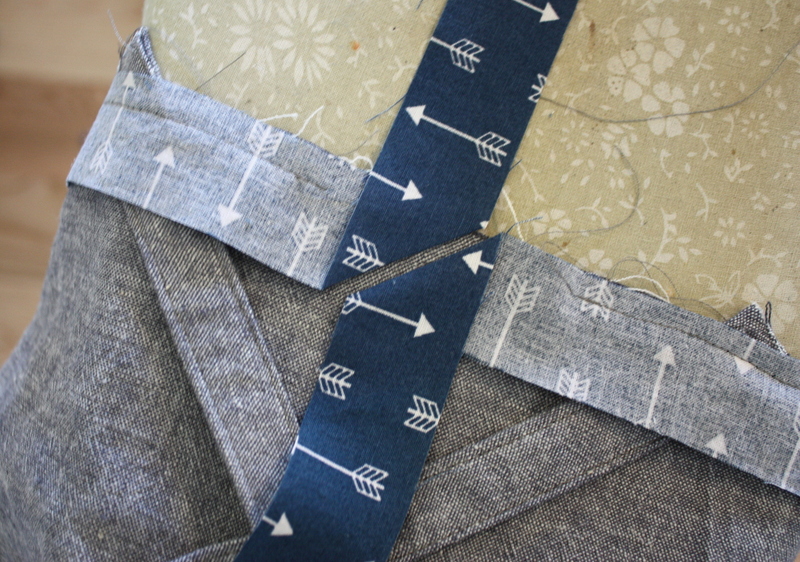 Baste the shoulder straps at this point angling them slightly so they will crisscross on the back. 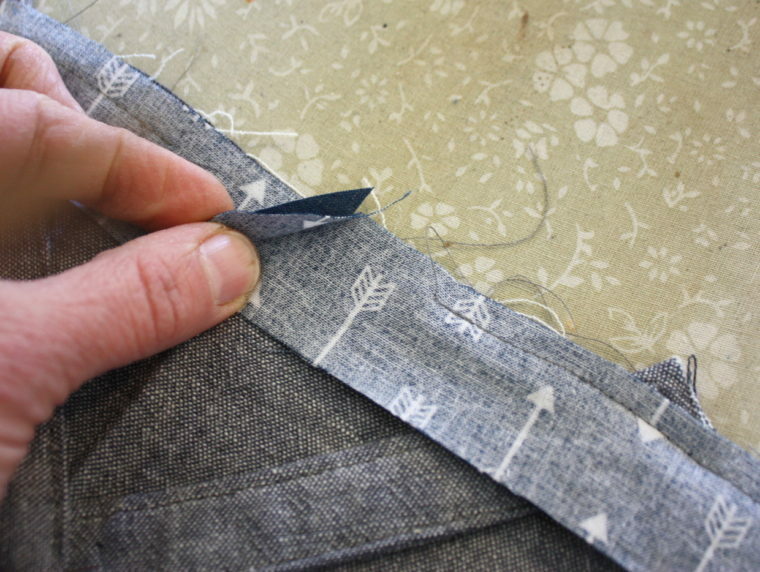 Prepare your waistband facing by folding and pressing one long side to the wrong side by ¼ inch. 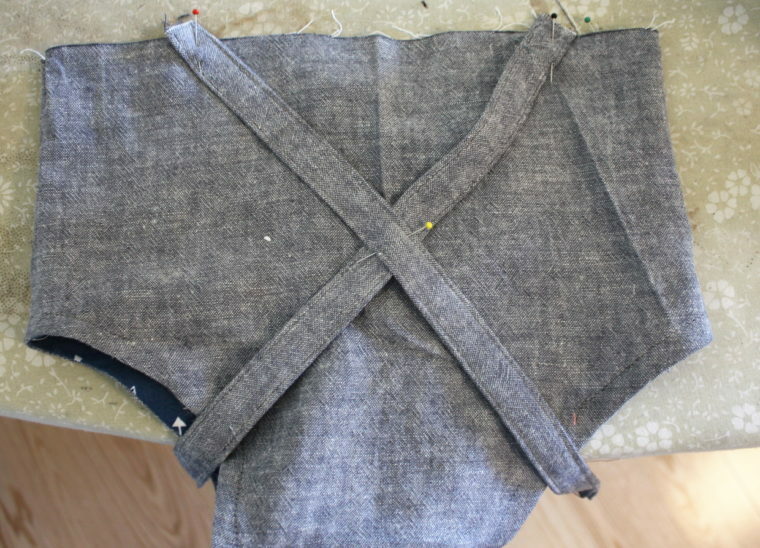 Next, pin the unfolded long side of the waistband to the bloomer bottoms with right sides together, sandwiching the bib and the straps between the bloomer bottoms and the waistband facing. 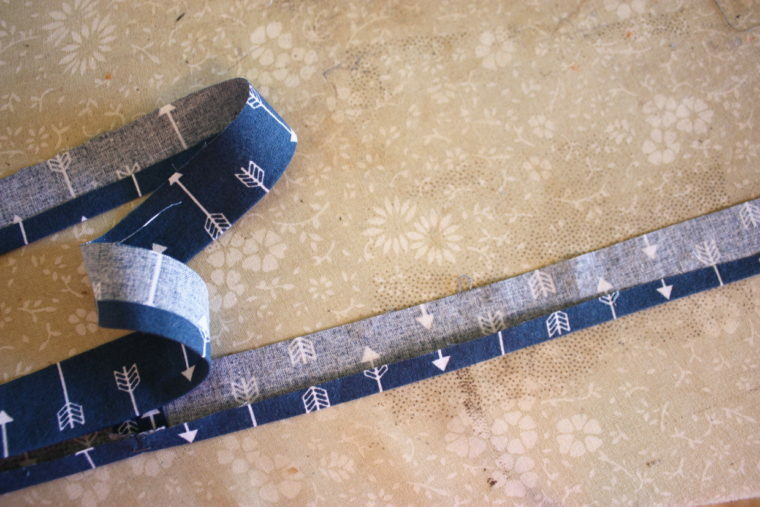 Sew around the waistband facing with a ¼ inch seam allowance leaving about 3 inches of the waistband facing unsewn at the beginning and end. 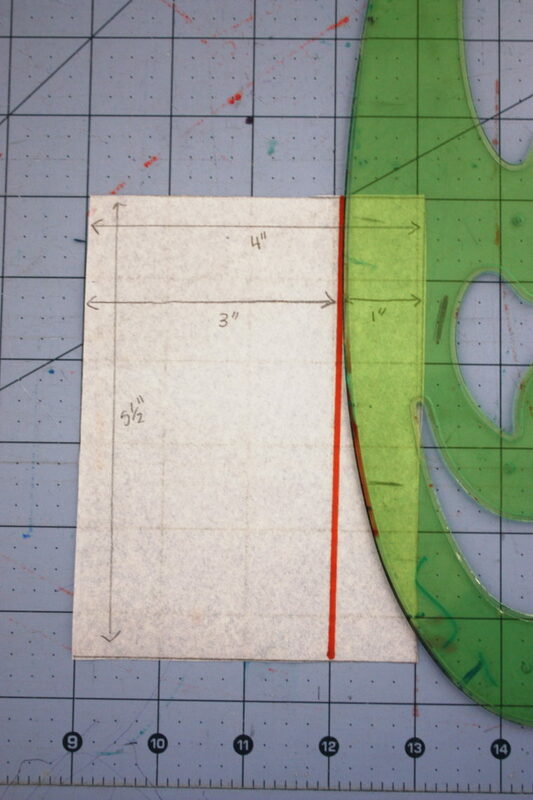 Bring the two un-sewn sections together and fold them to form 45-degree angles where they meet. 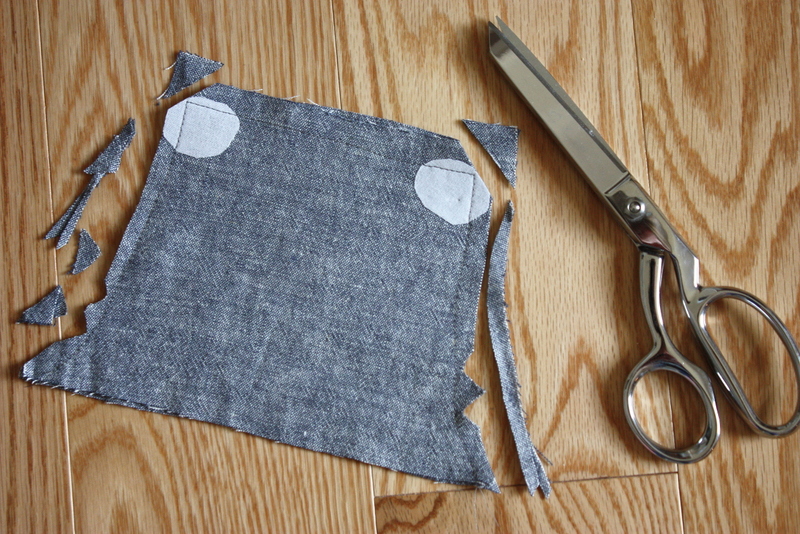 Trim the excess waist facing about ¼ inch from the folds and then pinch the folds together and sew along the folds. 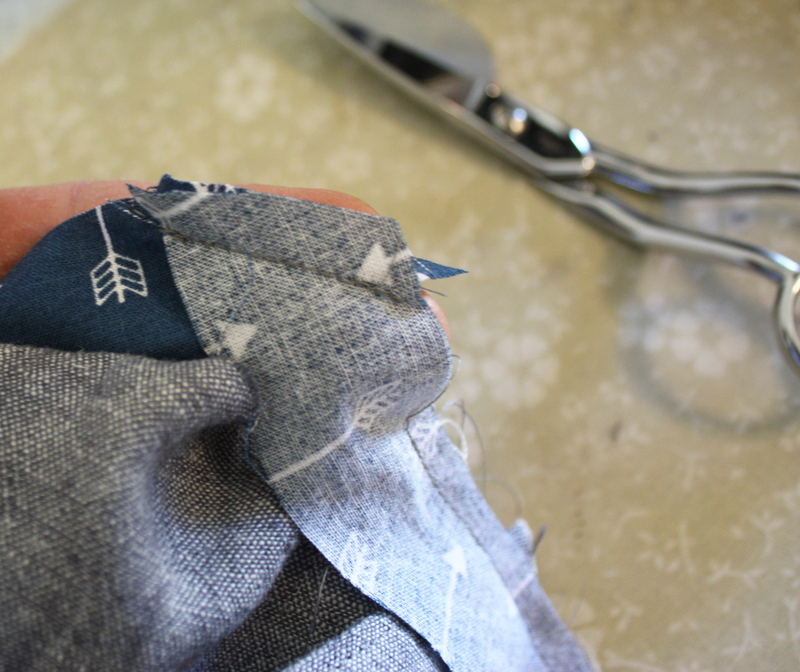 Open the seam allowance and iron it smooth. 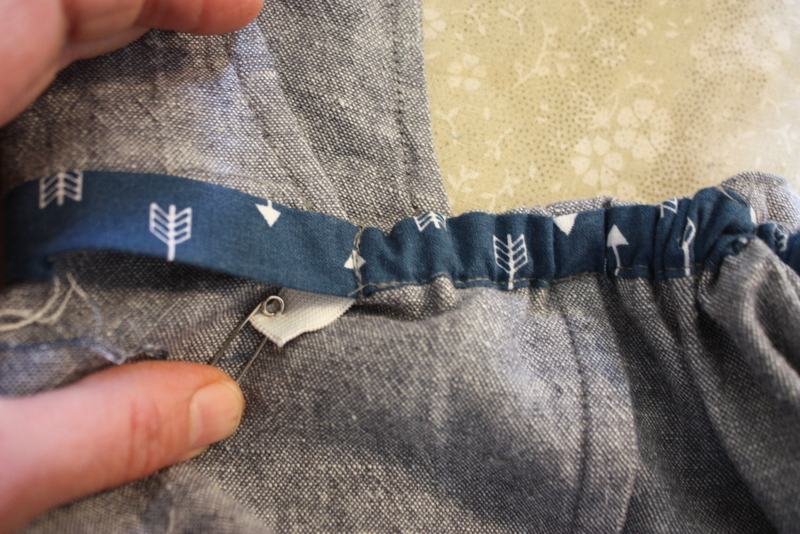 Now you can sew the rest of the waistband in place. 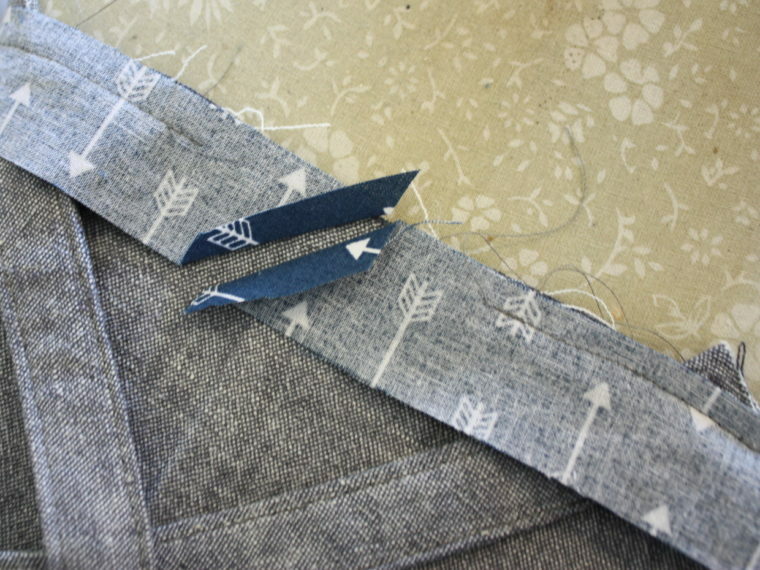 Fold the waistband facing to the inside of the bloomer bottoms and press it down. 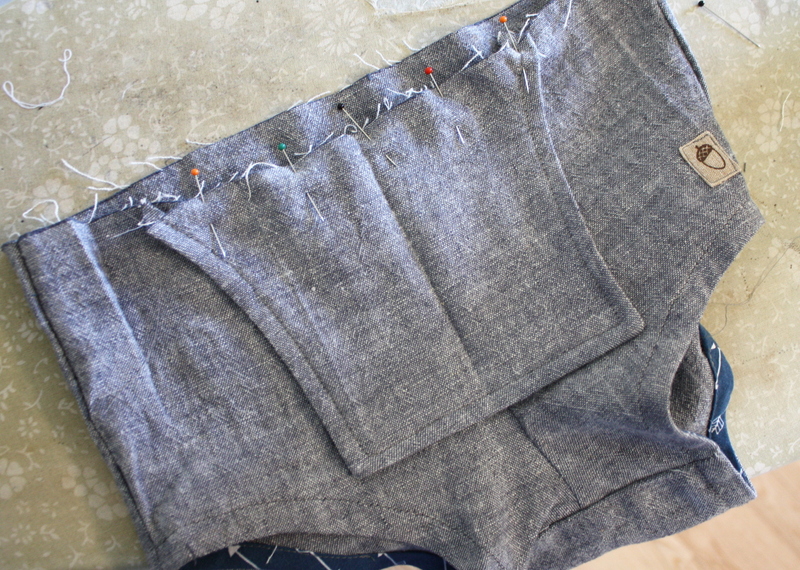 Pin the folded waistband edge down around the back of the bloomers. 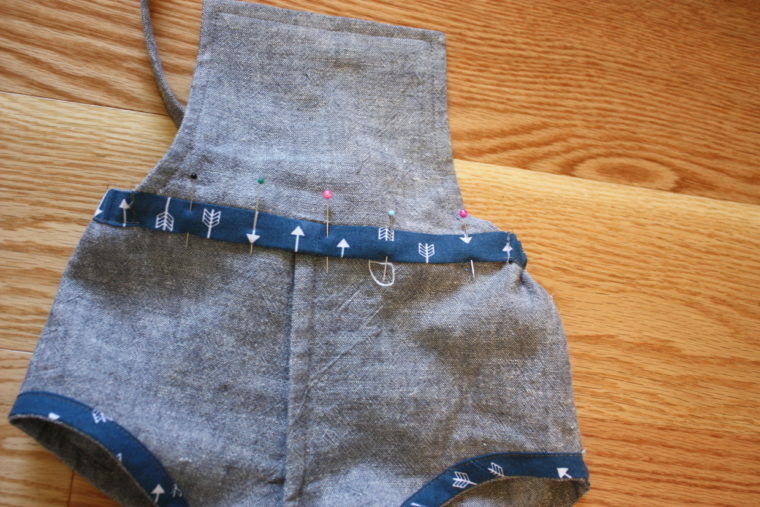 Edgestitch the bottom of the waistband around the entire back but not under the bib. 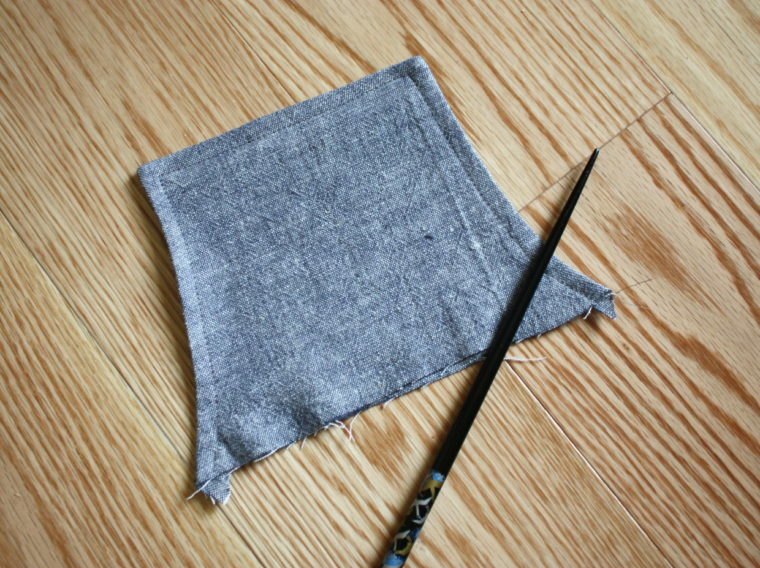 This creates a casing for the elastic. 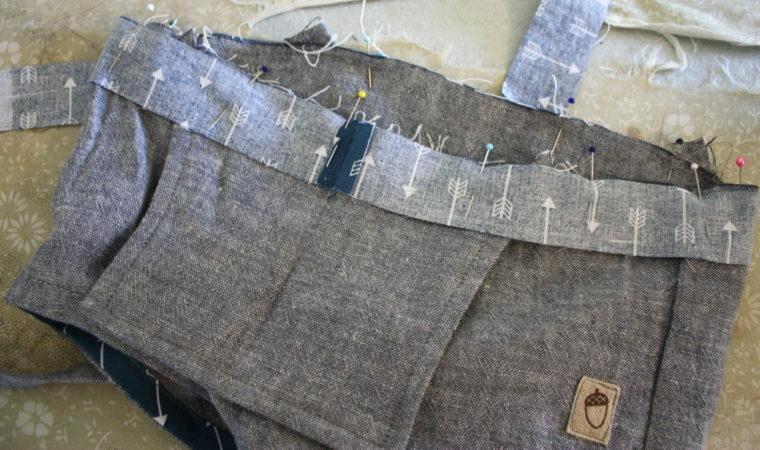 I always use double pins to remember where to start and stop sewing. Using a safety pin and ½ inch elastic, thread the elastic through the casing securing it at the edge of the bib on both sides. 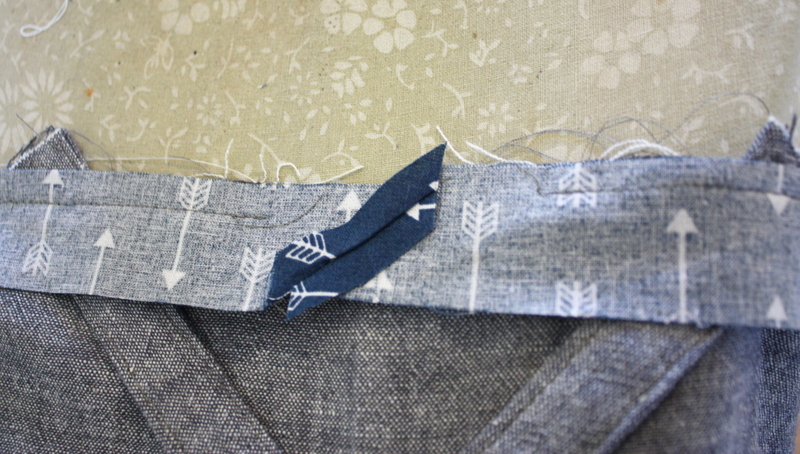 To complete the waistband, edgestitch the waistband under the bib for a neat finish. 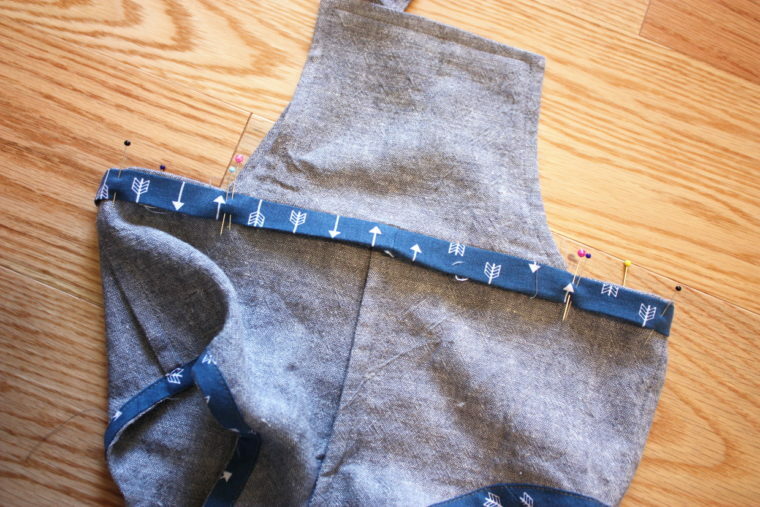 Add buttonholes to the top of the bib near the corners. Next you need to finish the edge of the shoulder straps. 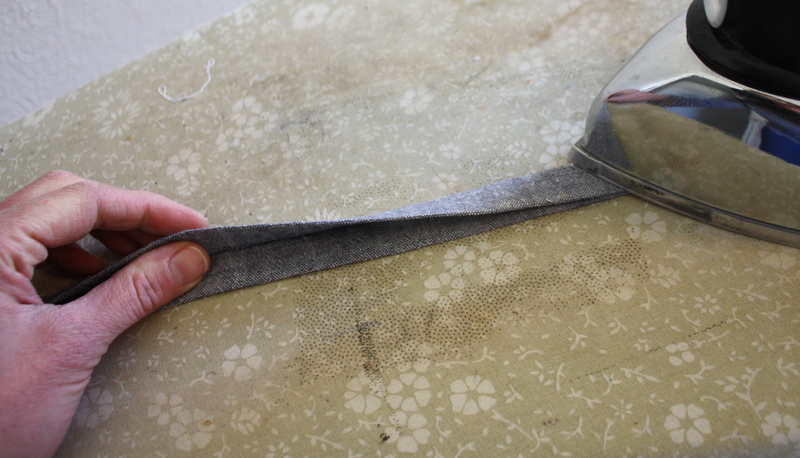 To get the strap length right it helps if you can try the bloomeralls on the recipient. Cut away any excess you may have. 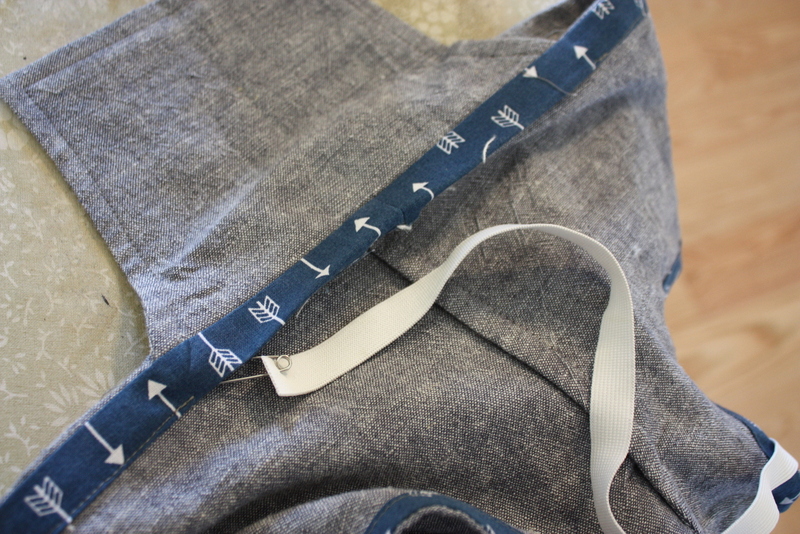 Add buttons near the end of the shoulder straps. Don’t forget to add the elastic to the leg holes according to the Seashore Bloomer pattern instructions, and you are finished! Oh, my! Too cute for words. super cute! 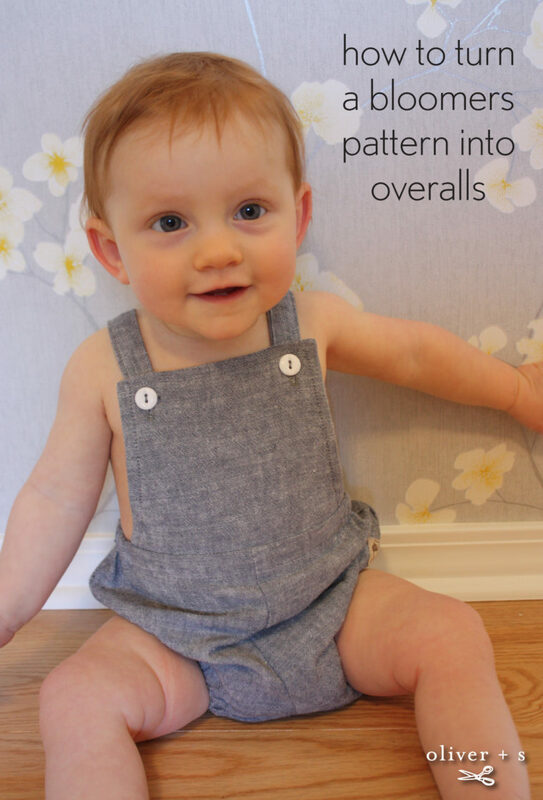 I am going to make a pair of these for a friend’s new baby- thanks for the tutorial and a way to reuse a beloved pattern that none of my children fit any longer.